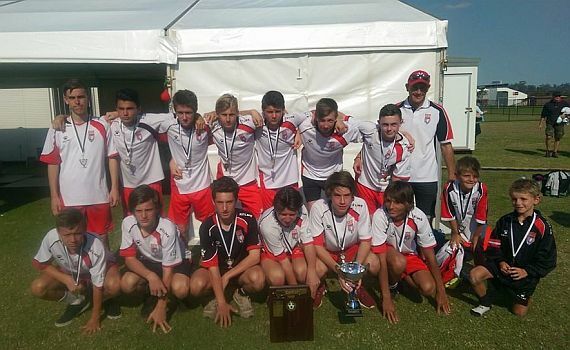 A number of ECU Joondalup junior teams took part in the Bunbury Football Carnival last month with all sides having successful weekend. The under 15’s won their tournament, going through the day undefeated. In the first game they took on Balcatta, and goals from Bayley Brown-Montgomery and Calum Speed gave them a 2-0 win. They drew the next group game 1-1 with CCSJA Bunbury, with Jacob Jones on target, before their third game against Rockingham City was forfeited. In the final group game they took on Perth SC and ran out 5-0 winners. Brown-Montgomery, Speed, Brent Quick, James Bruce and Luke Rhodes were all on target. In the semi-finals they came up against Stirling Lions, and after the game ended 0-0 it went down to the dreaded penalty shoot-out, ECU winning 4-2. In the final they took on local rivals Sorrento, and in a tight contest the only goal of the game came from Brown-Montgomery, to seal a 1-0 win and end the tournament on a high. The under 11’s B fell in the semi-finals to Perth SC, but they also had a great tournament. In the first game they beat Subiaco 8-2, with Ryan Blackshaw, Sam Nunn and Sebastian Gomez scoring doubles, while others came from Aston Montgomery and Aikido Kosimoto. In the next game another brace from Nunn and another to Gomez gave ECU a 3-0 win against Inglewood United. Then they beat Armadale 3-1, with Nunn, Montgomery and Kosimoto on target. In the final group game they took on Subiaco again, and drew 2-2, Ethan Banks and Ryan Blackshaw on target. In the Semi-Final against Perth SC the game could have gone either way, Banks scored twice for the youngsters but Perth ran out 3-2 winners.